Mike, what’s your opinion about…? Mike, what’s your opinion on…? Mike, what do you think about…? What are your (first) thoughts on…? What are your feelings about…? Mike, how do you feel about…? Could you tell us how you feel about…? Could you give us your thoughts on…? 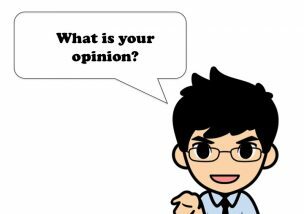 Do you have any views on…? Nicole, do you believe there is…? Mike, in your (honest) opinion, do you think…? Jack, from your perspective, is there…? Could you tell us a little more about…? I’d like to hear little more about that. Could you expand a little bit on what you said about…? Could you explain in more detail…? Could you be more specific about…? Could you give an example of…? Please tell me more about why…? Is there any particular reason why…? Why do you feel that…? Thank you for reading until the end! What did you think?